Here's a chance for me to re-live a portion of my teenage years. At least an automotive portion of my teenage years. I mentioned in an earlier post that my very first car was an Opel station wagon. One just like it, only in green where mine was red, is now available on eBay. 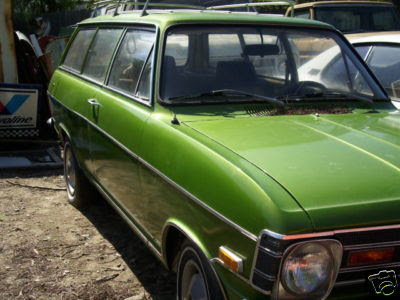 The seller of this 1970 Opel wagon describes it as being in "ridiculous stupid immaculate condition". That may be a bit of an exaggeration, but it appears to be in very good condition. It's the nicest one I've seen in a very long while. The seller gives few details about the car other than it was once owned by Opels Unlimited and that it has just over 62,000 miles on it. Opels came with a choice of two engines, a 1.1 liter and a 1.9 liter. I'm not sure which one this has. Both engines were reliable, but, obviously, especially with an automatic transmission, a 1.9 is preferred. (If you buy this and it's a 1.9 throw out the original carb and put on a Weber. It will save you a lot of headaches in the future) The seller leaves a phone number to call for further information. Mechanical parts are still relatively easy to source as many of the parts are shared with the Opel GT (which has a very good following in the US), but body panels are getting scarce. Fortunately, this car seems to be straight and rust free. In 1969 and 1970 Opel was selling more cars in the US than any other import brand except Volkswagen, but there are very few Opels left. Still, this car will never be a collector's item or worth any real money. Buy it to drive it and bring it to an occasional car show. An Opel wagon is certainly not the fastest or best looking car you could buy, but it's a piece of automotive history from back when GM seemed to actually have a clue as to what the American car buying public really wanted. Click here to see the eBay listing for this 1970 Opel Kadette wagon. Click here to see the website of the Opel Motorsports Club, which is probably worthwhile joining if you buy this or any Opel.